Those who have Xin Metal as their [Original Destiny Source Deity] would have a nature similar to that of gold, silver, pearls and jade, full of gentility and grace. Just as gold, silver, pearls and jade radiate in their extraordinary luster and are quick in reacting and conducting heat and electricity, this type of person is refined and sensitive. She views the world in a unique way; she pays careful attention to various things. She is kind and helpful. Sometimes she lays great burdens on herself because she compulsively takes pity on others. This type of person is exemplary in character, very charming and can attract attention easily. She is skillful in everything she does and on good terms with everyone. She seems smooth and slick to all but inside she actually feels very strongly about whom she favors and whom she dislikes. She has very strong self-esteem; she hates losing face. She loves novelty which she is willing to pay dearly for. She values material comforts and is inclined to be vain. Her weakness is being wayward and finicky. Too often she insists on having her own way and refuses to give way. She is also obsessed with her appearance. She who has Xin Metal as her [original destiny source deity] cares very much about face and friendship. As a result, she finds it hard to say no when being approached for favors, which exposes her weak will. 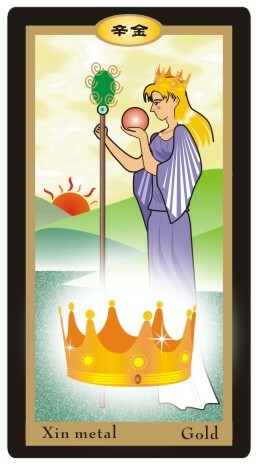 Furthermore, because she has a strong desire for material things, she’s easily tempted by money or material gains. As a result, she is not very good at self-control or sticking to her personal ideals or principles. Though the destiny main is Xin Metal with the above mentioned gold, silver, pearls and jade tending to ‘static’ features, if your destiny mold is tending to dynamic horoscopes, such as: ‘Qi Sha、Shang Guan、Jie Cai、Pian Cai’ etc. Perhaps it will present ‘Dual conflicts personality’!